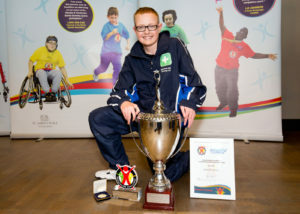 Colchester teenager Ethan-Beau Howes has won the 2016 Jack Petchey Outstanding Achievement Award – Panathlon’s top individual honour in the London & Essex area. The 15-year-old collected his award from Paralympic swimming champion and Panathlon Ambassador, Liz Johnson, in a ceremony at the Olympic Suite in John Lewis Stratford City, having been selected from a longlist of the year’s 23 most outstanding Panathletes. Ethan-Beau is the eighth winner of the annual award, which celebrates some of the most inspirational individuals to compete in London & Essex Panathlon events each year, and was among ten inspirational young people from across three categories to be recognised at the ceremony. The Panathlon Sporting Achievement Award was won by Jamie Brown of St Giles School, Croydon and Shane Gunesh of West Lea School in Enfield was crowned the Panathlon Young Leader of the Year. Three years ago Ethan-Beau, who as well as his AHD, has a chromosome abnormality, a heart defect and has had spinal surgery, became a pupil at Doucecroft School in Colchester, from the mainstream system after being out of school for an extended period during treatment at Great Ormond Street Hospital. When Ethan-Beau started swimming at the school he was very frightened of the water, due to having a rod in his spine and other physical problems. Andrea and his teachers coaxed him out from the end of the pool. He has since competed in Panathlon swimming events. He was presented with the top trophy by three-time Paralympic medallist Liz Johnson, who commented: “I understand how hard it can be to conquer a fear, such as swimming. Overcoming this demonstrates the power of sport. Helping to present the awards was one of these role models. inspirational youngster Scott Pope, the Panathlon 2014 Outstanding Achiever runner-up. Scott thrived on being involved in Panathlon, taking part in athletics, football, polybat and standing long jump, where he had a great deal of success. Scott progressed from Panathlon football player to assistant coach and led his team mates all the way to the final at Wembley in 2013. Since his success in the Panathlon awards, Scott is studying a Level 2 BTEC in Sports and Public Service at Barking and Dagenham and is a qualified trampolining coach. This year’s Hassan Ahmed Memorial Sporting Achievement Award winner Jamie Brown, 15, of Croydon has cerebral palsy and is an electric wheelchair user. His condition also affects his speech and he communicates using an iPad. His teacher Fiona Bell of St Giles’ School, said: “I am so proud of Jamie. He is a natural sportsman, gifted in terms of tactics and is great at football and boccia. Panathlon has opened so many opportunities to him; a whole new world. He’s a fantastic leader and always cheers on his teammates. Despite his communication difficulties he encourages younger ramp users in the school and has even designed “Jamie’s Top Ramp Tips” for these children. Shane, 17, transferred from a mainstream school to West Lea School, Enfield, when he was 14 and was immediately involved with Panathlon. Still shy and lacking in confidence he was chosen to play for the school in the Panathlon competitions. A turning point came when he undertook Panathlon leaders training and led at events for two years. He joined the Enfield leadership academy where he achieved the Boccia Young Officials Award. He subsequently officiated at the London Lords Taverners Disability Boccia tournament delivered by Panathlon. He is now a young ambassador for the Autistic Society where he regularly helps people with learning difficulties. Outside of sport he is involved in ceramics and dance where he runs these activities for the local hospice. Shane starts Enfield College in September and he sees his challenge to inspire others to get involved in sports and leadership. The Jack Petchey Foundation is Panathlon’s longest-serving supporter, investing over £600,000 in the charity’s work in London and Essex over the last 12 years. In March this year the foundation handed over a record cheque for £99,958 to the charity, ensuring many more young people can benefit from the Panathlon programme of sporting competitions. The Jack Petchey Outstanding Achievement Award was first awarded in 2009. The Jack Petchey Foundation provides grants to programmes and projects that benefit young people aged 11 to 25. John Lewis Stratford City has been a firm supporter of Panathlon since the London 2012 Olympic and Paralympic Games, when it was selected by staff as one of four local charities to support. This is the 5th annual Jack Petchey Awards ceremony to be hosted by the store, which has donated £50,000 to Panathlon over the last four years. Jack Petchey Outstanding Achievement Award. Winner: Ethan-Beau Hawes, Doucecroft School, Colchester. Highly commended: Harry Bowtell Hall Mead School Havering. Runner-up: Mercedes Jacdonmi, St Angela’s School, Newham.